Glebe Town Hall is built on part of a grant in 1796 of 400 acres to Reverend Richard Johnson on Church of England property known as the Glebe. Trustees of the Clergy and School Lands Corporation subdivided the Glebe into large allotments and retained 40 acres for the Archdeaconry land which was later subdivided as the Bishopthorpe Estate. These allotments were offered on 99 leases. The second allotment on which the Glebe Town Hall is located was originally part of Catherine Farm and was later subdivided as the Forest Lodge Estate. This later was sold by G. W. Allen to Fredrick Wells in 1868 and then sold to the Borough of Glebe in 1878. Glebe was proclaimed a municipality in 1859 and was the fourth municipality to be incorporated under The Municipalities Act 1858. The Glebe Town Hall has a strong association with a number of significant people. Since its formation in 1859 the Glebe Council had been the domain of local professionals and businessmen. Between 1859 and 1875 the early Glebe Aldermen consisted of men such as the solicitor George Wigram Allen, Mayor for 18 consecutive terms from 1859 to 1877, the architects Edmund Blacket and George Allen Mansfield, surveyor Thomas Harwood, chemist William Pinhey, retail trader Michael Chapman, and the future State Premier George Dibbs. Council meetings were initially held at various locations around the municipality. By 1878 the Council began to discuss the need for Town Hall and School of Arts. The initial proposal for the construction of the Glebe Town Hall was recorded in the Glebe Council Minutes, 4th November 1878. The proposal was to hold a competition for the design of the Glebe Council Chamber and School of Arts with £15 offered of the best design. Ambrose Thornley Junior was appointed architect for the Glebe Town Hall at the Building Committee meeting on 6th February 1879. The building of the Glebe Town Hall was commenced in 1879 and completed in 1880 by Sanbrook and Son. The Glebe Town Hall was opened by the Mayor Thomas J. Dunn and the project was completed at a cost of £4,600 with an additional £500 for the cost of furnishing the Glebe Town Hall. The Town Clerks residence as the building was later called is located on Lodge Street and was completed prior to the principal council chambers as indicated in Council’s Improvement Committee Minutes of 1880. This would seem to indicate that the Council Clerk’s residence was occupied prior to the opening of the main building and may have been constructed on the principal allotment of the land before the building of the Glebe Town Hall. This building is still owned by the City of Sydney but is currently unoccupied. In 1889, the Glebe Council decided to extend the existing Town Hall to provide an additional smaller Hall, Meeting Room and new Council Chambers. The design of these additions was carried out by the architect Ambrose Thornley, Jnr. The new additions were designed by Thornley in the same style of architecture as the original building The new additions were located on the Mt. Vernon Street side of the original building and consisted of new Council Chambers and meeting room on the ground floor with a new entry from Mt. Vernon Street. An additional stair provided access to a secondary hall and several smaller rooms on the first floor. An elaborate cantilever timber balcony was located on the first floor adjacent to the new meeting hall. The new additions also contained a basement level created by the slope of the land along Mt. Vernon Street. 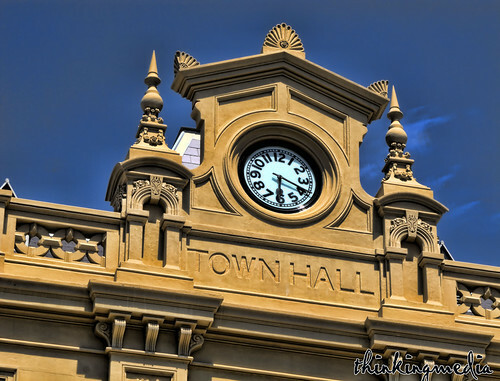 The Glebe Town Hall was regularly used by the community for important civic occasions and well maintained as a reflection of the civic pride of the area. The Glebe Council conducted a regular program of maintenance and repair on the building, with major improvement in facilities also undertaken by the Council from the earliest periods of occupation of the building. Connection to the sewer had originally been recommended by Council in August 1890. The work was completed in 1892 and the building was connected to the sewer lines located in Mt. Vernon Street. Many local town halls throughout Sydney were also used for meetings during the First World War, and in 1916, a meeting was held in support of compulsory-reinforcements at the Glebe Town Hall. The effects of the Great War of 1914-18 were strongly felt by the Glebe community, and like many Sydney suburbs Glebe lost a large number of their residents during the First World War. A Roll of Honour memorial plaque of soldiers from the 1914 -1918 World War was erected in the main foyer of the Glebe Town Hall by the ratepayers and householders of Glebe to commemorate this loss. The Glebe Council had a succession of aldermen who later became members of the Legislative Assembly. These men included George Wigram Allen, William Redman, George Dibbs and Michael Chapman. The Glebe Town Hall also has strong associations with the Glebe branch of the Labour Party. From 1892 meetings of the Glebe Branch of the L.E.L. were held at the Glebe Town Hall. By 1925 the Glebe Council was controlled by Labor representatives with 11 Labor Aldermen elected to council, and Bill Walsh became Glebe’s first Labour Mayor. Another important member of the Glebe Community who served on the Council from 1934 was Dr. H. J. Foley, a medical practitioner and social reformer. He was made Mayor of Glebe in 1938.